Sworcery is a mobile game first and a PC game second. The most obvious of concessions for today's smart phones result from the limited buttons available. In targeting those platforms, game mechanics must be designed to be accessible by tapping the screen in some way. For this PC release, as most computers are not yet touch sensitive, all aspects, from combat to GUI navigation, are controllable solely using the mouse, taking over the role of index finger, pinky, or fat thumb. Where traditionally buttons would be used for character movement, holding down the mouse on a path instead guides the character. While it is fanciful on a PC to play an entirely with a mouse, with some nostalgia to the King's Quest games of yore, there is too much dependence on tiresome 'tap and hold' and 'drag' mechanics, where a button equivalent would have more than sufficed. Sadly, with few exceptions, the developers don't give the option to control with buttons: Moving the character not being one. The tactile benefit from touching the game objects is also lost in translation to a mouse. Having touching controls is ok on a touchpad where I can precisely rub a spot, but it just feels tedious using the hand-to-mouse-to-screen channel. Puzzles were an unsatisfying affair. Upon coming to a puzzle, I knew it had to do something with touch, but what was I supposed to tap/click? In most cases, it meant tapping objects in a certain order, from large to small, or rubbing certain onscreen objects. For the easiest puzzles, the game highlighted the objects to tap, but more often that I would have liked, finding how to start a puzzle required randomly clicking items on the screen until something reacted, both not requiring any thought. Once the gist of the puzzle was known, determining the solution was the other half of the battle. At the worst of times, when I had 'beaten' the puzzle, I wasn't sure what method I had followed to solve it. Consequently, stumbling upon solutions was harrowing, not enticing, and I found ultimately all puzzles were time-wasting burdens against continuing the story. Maybe combat can make up for the deficiencies of puzzles? Unfortunately, no. Combat is a passive dance between attack and defend commands. The enemy decides its move, and the player responds. The issue is that battles are engaged at an angle of nearly 45° with 2D sprites. Strict rebuttal timing is everything and the in-range engagement zone being partially obscured by the hero's own body hinders this. The player's depth perception of incoming attacks is also tested at that combat perspective inserting a difficulty that is undeserved for the adventure game. Furthermore, the combat proves inconsistent as determining what attacks must be countered via shield or sword is a guess and check effort. On a positive note, the passive response combat allows for great integration with audio cues and the background track. While the visual gives poor timing, the audio cue can be used instead. Not everything was a casualty of mobility. One of the more original elements of Sworcery is its dependence on the cycles of the moon. Gaining access to the third and forth chapters requires waiting for either a full moon or dark moon, in real time. REAL TIME?! Yes. As a mobile game, the developers expect the player to stop, take a break, get out of work one evening to notice a full moon, then begin to play anew. Compounding this design aspiration was the addition of a plot summary upon starting the next chapter: The game's narrative character, whose cigar smoking antics gave the same vibe of Mass Effect 2's Illusive Man, regales the story up to that point. As a cool addition, the game tracks past conversations and catalogues them according to the moon cycle they were received. To be honest, I feel the moon breakup is another problem with the PC version. I can only comment on my own experience, but as a PC gamer, I typically sit down to play a game and devote a block of time for that purpose. So when booting Sworcery, I was planning to play until I needed to stop. Upon reaching to the moon cycle barrier, I immediately searched for a workaround. The in-game megatome stated 8 days until the next moon cycle, but screw that! Luckily, there were ways to bypass the real-time wait. Yet… by doing so I completely killed the essence of the moon cycle. The narrator retelling the story. The moon phases tied to the messages. That was all a waste on me. When I scrolled through the chronicled messages, there was no variation in moon wane. The chapter overviews were humorous, but felt out of place hearing them all at once. A terrible waste my gorging, that if ingested in smaller packets would have made a greater emotional impact. It is a shame, as from purely a design perspective, the moon cycle was an original and positive addition. 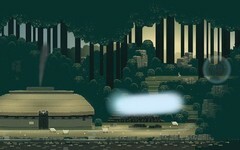 Sworcery's 2D graphics are purposefully pixilated. The characters are all tall and lanky, with their legs and hands of one pixel width each. Pixel bushes have contrasting pixel leaves, and a pixel dog leads the player through a pixel forest as a guide. The graphics overall are delightful, and while the character faces are but a singular pixel, the emotion still oozes out. When a skeleton warrior takes a hit, it's animation is so fluid as it recoils, that it looks shaped of 3D blocks rather than precise pixel squares. In stark contrast to the pixels are the number of gradient effects, which are very smoothly anti-aliased. Their presence gives the game its modern flare, from sparkles to rainbows (eww rainbows). 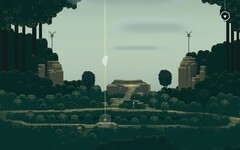 While Sworcery allows for zooming the camera, the game feels best left at a far view; zooming imparts no added detail. Besides, the benefit of the PC version is its ability to display ALL those pixels. Calmly traversing the pixelated land is second only to the sound as to why I would recommend giving this game a moment's time. We found the game's sounds and music to be bold and we were happy. Why did I just speak in the second person just then? Anyways, together with the pixels, the acoustical choices are the best part of Sworcery. The music has a stirring and surrounding quality that objectively supports the adventure genre. Very fitting as it is, but while soundtracks for videogames try and obscure themselves to support the onscreen action, Sworcery's bold flavor of synthesized instruments and conventional has richness to the quality that grabs you. It really is a soundtrack that could sit on your MP3 player and enhance an event. It doesn't have to be Sworcery. While the soundtrack hovers over the events of the game, I'd say the gameplay probably isn't worth suffering over just to hear the music. Instead, the soundtrack could be enjoyed, not alone, but billowing over anything you want to put with it. Going for an epic walk? *kabloosh*, there you go. The game's sound effects follow the same style of the music. Actions such as the swinging of the heroine's sword emit a cavernous echo slash. The cry of that heroine is equally cavernous and alarming. Since I'm not often used to having sound effects that stick out so much, I found it rather refreshing. It reminds me that I'm playing a game, and probably better, these sounds feel powerful without resorting to the distorting sizzle of explosions. Not every sound demands voice. As the lagomorphs and deer dart into the brush, and the player brushes the sparkling water, small tinkling musical motifs are played. 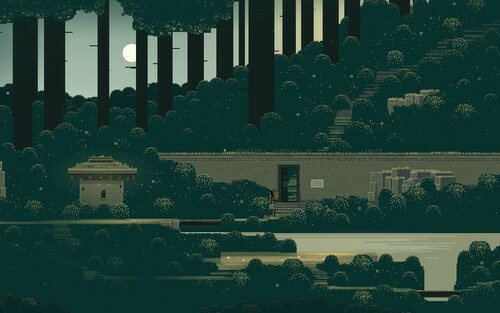 This is the more relaxing side of Sworcery, away from the pitfalls of puzzles and combat. Indeed, there is an optional segment to jam out to the gentle strumming of a wandering musician. I can recall only one voice-acted character, the woodsman, and he is my favorite part of the game. His awkward banter gives respite and subtle humor. "Oh hey, so uhh did you… hear about that uhh hmmmm… sport?" From the perspective of the impatient gamer who is rewarded in progress, sworcery features too much backtracking. The graphics are beautiful, but I'd rather enjoy them as a wallpaper then be hampered by reprise on my quest. To add to agony, the character's sauntering pace draws more attention to how much backtracking exists. The optimal design would have been to allow instant travel by double-clicking the sides of the screen to jump to the next. When cut scenes are needed on that screen, just disable the fast travel. Easy as that. The game takes about an hour and a half per chapter, but most of the time spent is hostage to traveling. There isn't much to say about the storyline except that while some may find the quixotic text accompaniment to be annoying, I found it a pleasant distraction. Your interpretation may vary. 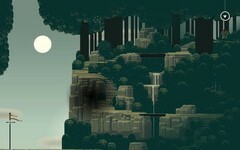 In summary: Sworcery has beautiful pixel artwork set against a flavorful soundtrack and audio-scape. Sadly, too much of the backdrop will be seen when backtracking. Puzzles are unrewarding, while combat is inconsistent. The addition of the moon cycle is great, but just not a great fit for a PC release. The same is said for the interactivity from mobile, and the limited control alternatives available. 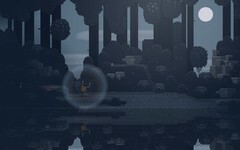 Sworcery would make an excellent audio-visual screensaver, but makes an ok game.